Side view of the Robert Gould Shaw Monument by Augustus Saint-Gaudens. 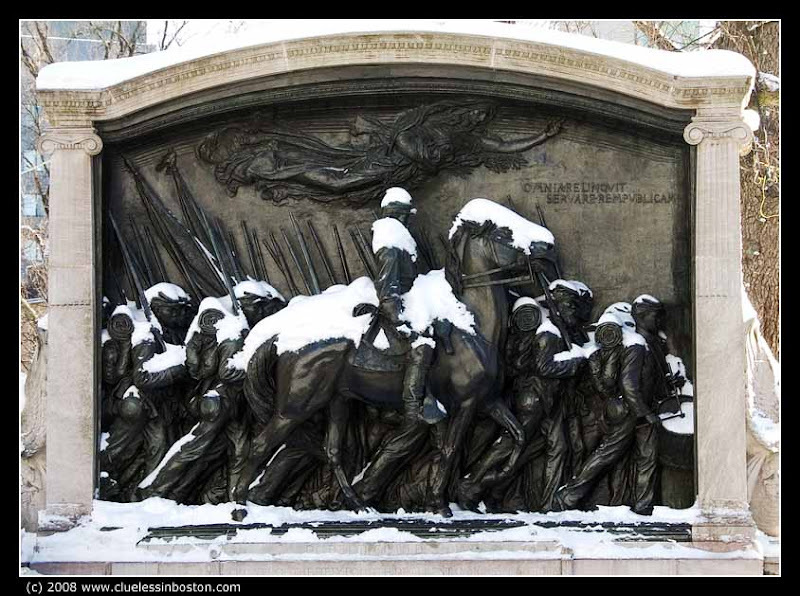 This relief monument built in 1897 in honor of the Massachusetts 54th Regiment is considered by many to be among the best sculptural works of the 19th century. The 54th was the first all-Black regiment recruited in the North to fight for the Union army during the Civil War. The monument is part of the Boston Black Heritage Trail. A famous composition by Charles Ives, "Col. Shaw and his Colored Regiment," the opening movement of Three Places in New England, is based both on this monument and the regiment. the new photo is very stately. the old one is very charming & gives more emphasis on the hardship they must of gone thru. I'm not familiar with the Ives' piece - will look it up. Oh I do not know which to choose! What a beautyful tribute! I remember a movie ( "Glory", with denzel Washington)telling the story of that special regiment. It's a beautiful monument with a grand story about behind...cool homage! I love this year's agle, it really adds the depth (literally) that last year's lacked. A beautiful monument for an even more amazing group. I like the side view better but am glad you posted the front view too. I walked past this monument many times during my 3 years in Boston. I like the way you've highlighted the side of the monument, a part of it that I sort of "looked over" as I was always focused on the front view. Great ART by both, the sculptor and YOU :-) Sculpting and Photography! What a fusion! Last year view is more visible, but this one is more interesting for the whole monument.